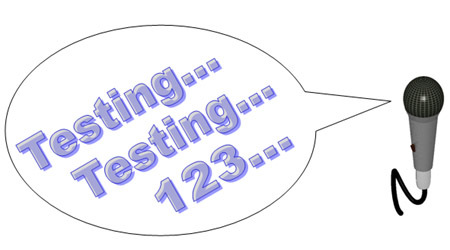 As the A/V Ministry leader at my church, the 2 words I can’t stand to hear during a worship service are "Test, Test". The sound of these two words sends me right into orbit! I mean can the person with the microphone not hear that it was on the first time they said "Test"? Sure I could beg and plead with everyone that may touch a microphone to NOT "Test" the mic during a live service but it would truly be an exercise in futility. The bigger question that I began to ask myself is why they are doing it. As a Quality Control Manager by profession one of the skills I use every day is the ability to drill down to root causes. I approached this problem as I would at work and began keeping track of who the offenders were and when they were most likely to do it. The results were alarming! The first thing I discovered was that those who are not accustomed to public singing/speaking often will say “Test, Test” simply out of nervousness. It functions almost like a defense mechanism, giving them some sort of false assurance. The second thing that I discovered is that many said these two words because of a valid lack of trust for the sound engineer. This lack of trust was based upon past and present performance (i.e. not have having the microphone on when it was time for someone to speak/sing). Armed with this information I began to implement corrective actions. For my nervous presenters I invited them to a sound check the night before church service. This would get them accustomed to hearing the sound of their voice through the speakers and address the defense mechanism of testing the microphone. Even if they were only doing the scripture or prayer I would invite them to come out and practice. I also gently counseled them on alternatives to “Test, Test” such as “Good Morning Church”, “Happy Sabbath”, “Praise the Lord”, etc. As for the lack of trust for the sound engineer, I implemented several measures to address that problem. First, cell phones/tablet use is not allowed. Second, I created teams that are on duty from Friday night to Sunday. The team that will be operating on Sabbath must come Friday night and be available for sound check. This creates a sort of bond between the front of house and rear of house personnel. Third, I noticed there was no communication between the platform participants and the audio technician. Sound technicians must give thumbs up each time someone is in front of the microphone or goes to pick one up. This lets the person on the platform know they are free to speak and a “Test, Test” of the microphone is not necessary. Fourth, the door to the sound room is locked during live services such as Sabbath School and Divine Worship. It only takes one minor distraction to impact the entire service. The team is not allowed to leave their station to answer the door during a live service. Anyone that needs to get in the booth has a key. Fifth, I placed laminated signs on the doors and sides of the booth that read “In order to maintain an atmosphere of worship, please do not disturb the Sound Team during service. Coupled with an announcement in the bulletin stating the same. As I often remind my team what you do, or don’t do affects 300+ people.